Fatumaru Lodge is offers a quiet waterfront location in Port Vila, Vanuatu and is only a short 10 minute stroll from the city centre or 2 minutes by bus, where there is an extensive range of restaurants, shops and activities to enjoy. 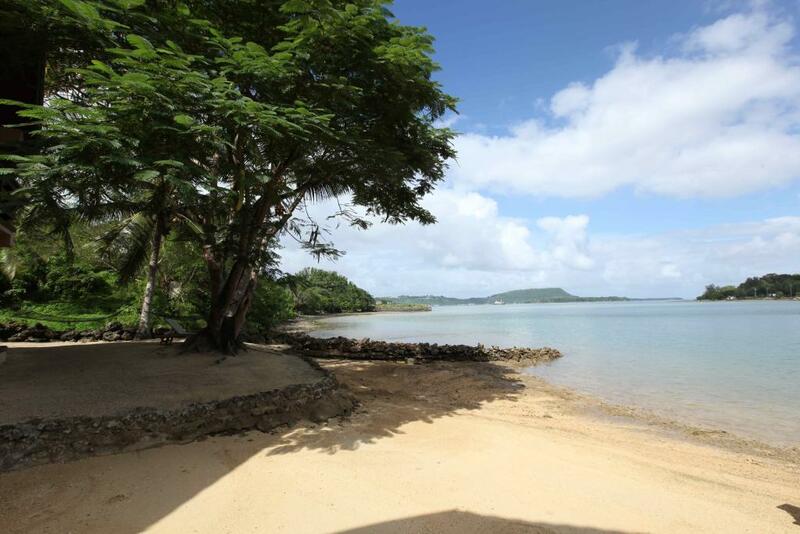 This affordable Vanuatu accommodation consists of 10 accommodations, 8 Seafront Studios and two 2 Bedroom Seaview Family Units making for a boutique Vanuatu experience. Fatumaru Lodge is perfect for friends, couples and families wanting to see Port Vila and Efate Island attractions. Many local tour companies will pick up and drop off straight to Fatumaru Lodge's doorstep. All of Fatumaru Lodge's rooms are fully self contained providing the convenience of self catering to all guests. In addition to this convenience, all Seafront Studio's have direct access to white sandy beach and private covered terraces overlooking the water. If you are looking for a relaxed boutique style Vanuatu holiday then Fatumaru Lodge if the perfect choice for you. Fatumaru Lodge offers an intimate and boutique Vanuatu experience whilst still being close to the city centre. Seafront Studio: 8 units in total and located along the beachfront with covered private terrace overlooking the water. Size is 46m². Bedding is 1 Queen Bed + 1 Sofa Bed. Maximum room capacity is 3 Adults & Children. 2 Bedroom Seaview Family Unit: Only 2 family units in total both with ocean views and separate bathroom, kitchen, two bedrooms and a covered private terrace. Size is 55m². Bedding is 1 Queen Bed + 2 Single Beds. Maximum room capacity is 4 Adults & Children. Seaview Penthouse : This luxury penthouse offers stunning views over Port Vila Bay from its large terrace. Features 2 bedrooms, modern kitchen, living areas, sound system and smart TV. Bedding is 1 Queen Bed + 2 Single Beds. Maximum capacity is 4 Adults & Children. Fatumaru Lodge offers a breakfast service around the pool and a large BBQ area where guests can prepare meals for their friends. Nearby Port Vila also has a host of restaurants and cafes to choose from. Alternatively there is the option of self catering with all accommodations at Fatumaru inclusive of fully equipped kitchen facilities. Adventures in Paradise offer seat in coach or private vehicle transfers from Port Vila Airport or other Port Vila accommodation to Fatumaru Lodge. Transfers can be added to your stay by clicking Instant Quote.